Did you do any grilling over the long holiday weekend? We enjoyed food off the grill every day, and it was fabulous! Saturday my dad made a ton of grilled ribs and chorizo. On Sunday we marinated and grilled some pork chops. But to me, the best thing we made all weekend was this Grilled Sriracha Broccoli. 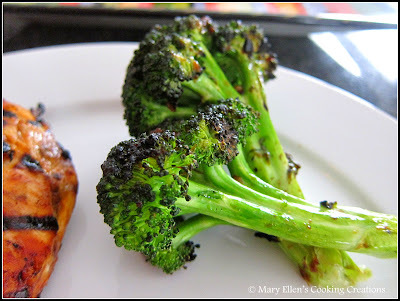 On Monday night we had chicken cooking on the grill, and I was in the kitchen looking at a large head of broccoli sitting on my cutting board when I decided to make a glaze and grill it. We had grilled broccoli before so I knew it would work. But adding the glaze before grilling it was new, and I was excited that I was struck with this little wave of inspiration. One tip before I get into the recipe - take your head of broccoli and slice it into three sections (if it's a large head). 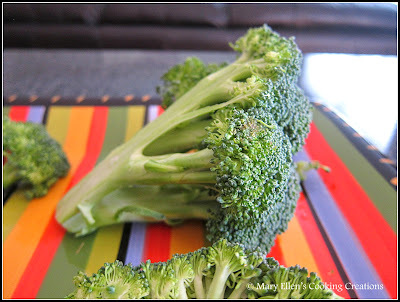 The 2 outer sections will look like the broccoli in the picture above - rounded on the outside with a flat edge to put on the grill. The middle section will look like the piece in the upper right corner of my platter seen below - flat on both sides. The last time we grilled broccoli we made a chipotle flavored butter to melt over it when it was done and it was really good. 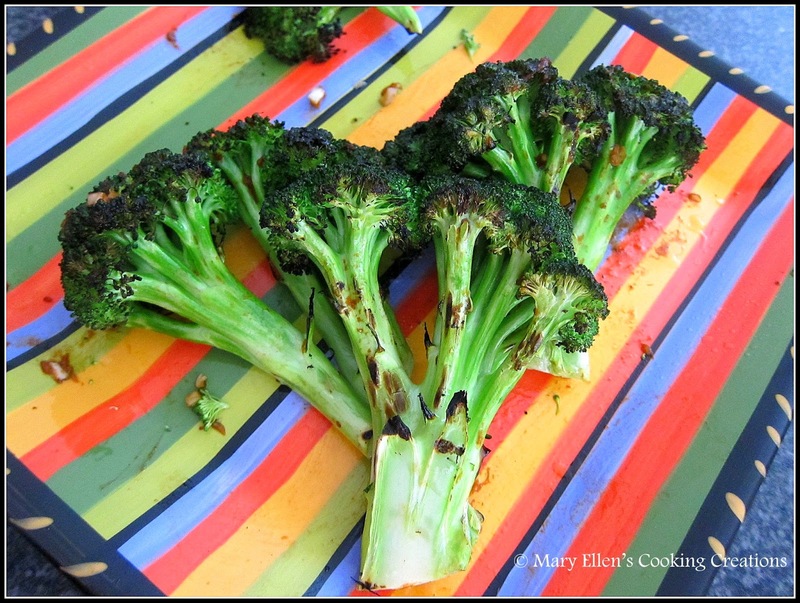 This time the glaze was brushed all over the broccoli before throwing it on the grill and wow, it was SO good! 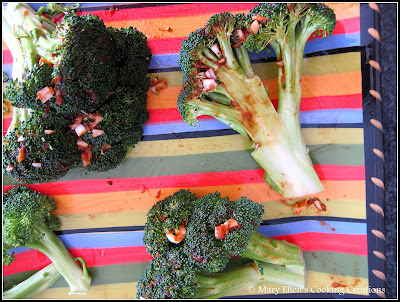 It was spicy and sweet, it caramelized, the broccoli charred nicely on the edges, and because it doesn't take too long to cook the broccoli, you don't have to worry about burning the garlic in the glaze. I can't believe I haven't commented on this. It is my favorite! I have made it so many times this summer, ah-mazing!!! !